I’ll never forget my first taste of an oyster. My French boyfriend showed me how it was done. He took an open oyster on the halfshell, detached it with a sharp knife and, in one swift gesture, let the glistening gray morsel slip into his mouth with its tranparent liquid. My turn. I copied what he’d done, closed my eyes and tipped the shell to my mouth. It was like swallowing a nutty salty mouthful of pure sea. This experience ruined me for life, oyster-wise. I prefer them raw, live actually, and straight from the sea. But every now and then I get the urge to experiment — as I did the other day with this recipe. These oysters, baked in the oven with a creamy sauce and a sprinkling of fresh baby spinach, fall into the French dining category of amuse-bouche — i.e. palate pleasers. They make a spectacular start to a meal, and you need serve no more than one per person, at the table or before you get there, during cocktail hour. They can, of course, also make a proper sit-down hors d’oeuvre, in which case one apiece would not be enough. But beware — these oysters are devilishly rich. And by the way, they bear only a fleeting resemblance to Oysters Rockefeller, a dish invented more than a century ago in New Orleans that a) does not use spinach, and b) does use breadcrumbs, which my recipe doesn’t. In France, they say the oyster season is limited to months with the letter ‘r’ — from September to April. That leaves two months or so to try this dish. Happy cooking! This entry was posted in 1. Starters and tagged gratinée, huitres gratinées, oysters, recipe. Bookmark the permalink. Meg: Wow! These oysters sound great. I was curious about your description of Oysters Rockefeller. I’ve never had them (the Rockefellers) without spinach. And bacon. And Pernod (or Herbsaint if you’re in New Orleans). 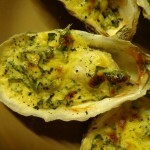 All delicious but your recipe celebrates the oyster and I look forward to making it.